Today’s episode is the audio of Juhem’s talk at the American Humanist Association (Washington, DC) on October 12, 2017. In this episode Juhem and Luciano discuss the Democrats’ reboot, also known as “A Better Deal.” They focus on three articles with different takes on the future of the Democratic Party. This week in The Benito Juárez Experience we digest the news from earlier this month about the United States withdrawing from the Paris Climate Agreements. Luciano does an excellent job explaining the importance and the limitations of the Paris agreements. I pitch in with some comments about the complexity of American public opinion regarding climate change. I draw from two main data sources: the Religion, Values, and Climate Change Survey published by Public Religion Research Institute and the American Academy of Religion on November 2014 (I worked on the design and analysis of this poll back when I was at PRRI); and the Pew Research Center’s Global Attitudes Survey from the Spring 2015. The PRRI poll says a lot about what Americans think about climate change while the Pew poll puts some of those opinions in a global context. 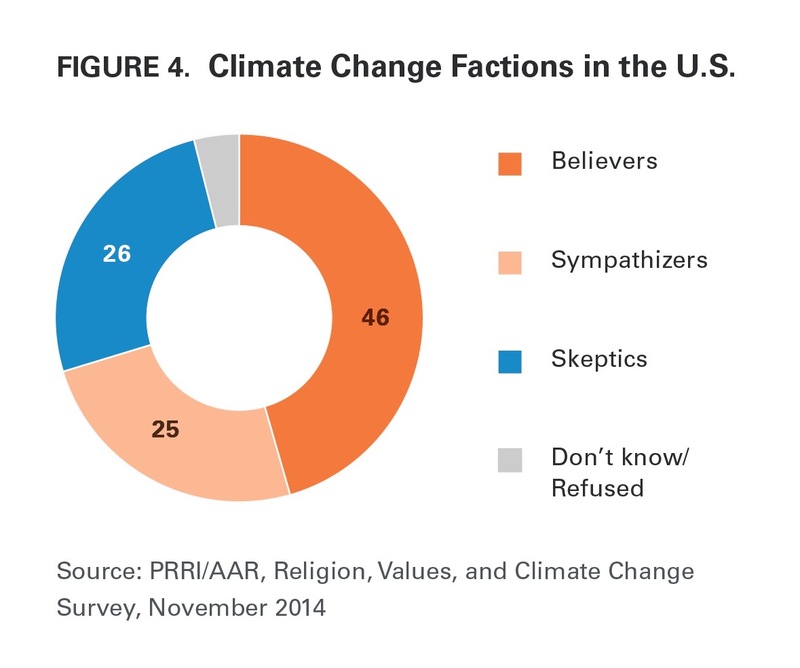 The PRRI survey developed three categories of attitudes about climate change: believers (who think it is happening), sympathizes (who agree it is a thing but not very concerned), and skeptics (who doubt CC is an actual thing). Luckily, the largest group is the “believers.” Unfortunately, less than half the USA population fits in this category. We know that most Americans do not fully believe climate change is an actual event worth acting upon. But it gets worse. Even those who are classified as “believers” are not particularly concerned. This second chart, from the same poll, shows that when asked about their level of concern, less than half of believers say they are very concerned. Only 3-in-10 Americans are very concerned about climate change. Among “sympathizers” just 4-in-10 have some level of concern (a combination of “very” and “somewhat” concerned). The reason for why even those Americans who think that climate chants an issue are not very concerned about the issue is due to a very weird strand of “American Exceptionalism.” In this case, most Americans think that climate change is a problem that the rest of the world has to deal with because it is not an American problem. The figure below shows how this plays out. A majority of Americans think that “people in poorer developng countries” will be impacted “a great deal” by climate change. 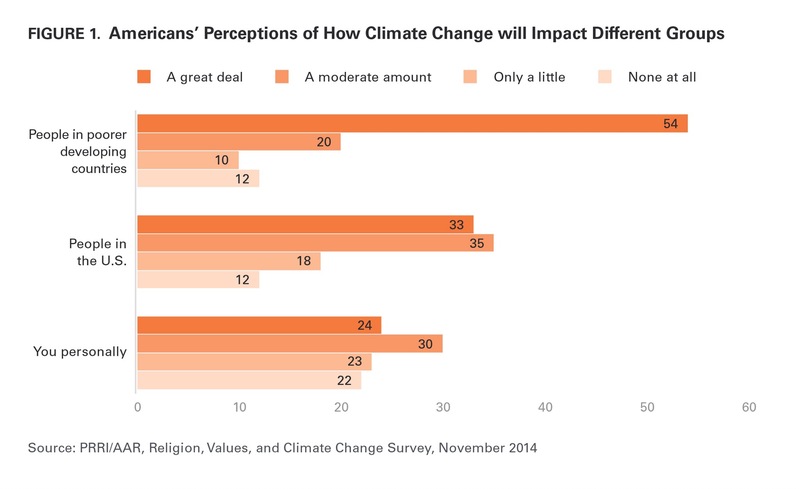 Only one-third of Americans think that climate change will climate change will impact people in the USA a great deal. It is a very selfish and foolish position. On one level, it is quite arrogant to believe that your country will be spared of the effects of something that will affect the whole damn planet. On another level it is also very foolish…in what ways is our country insulated from something that’s going on globally? The Pew poll provides some context of how out of line Americans’ opinions are compared to the rest of the planet. As Luciano points out in the podcast, the USA is one of the largest polluters in the planet. So, we bear a lot of the responsibility for this problem. And that’s what the rest of the planet thinks. 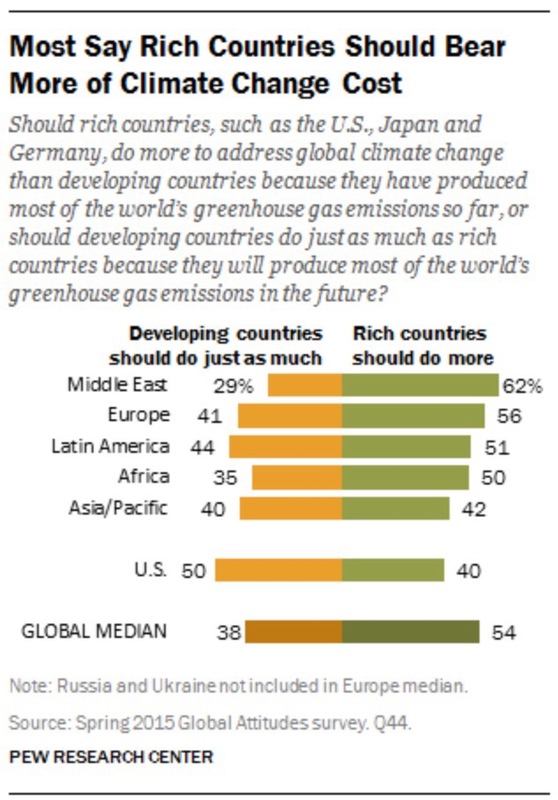 A majority of people in the rest of the world think that rich countries should bear more of the cost of addressing the climate change crisis compared to developing countries. Only in the USA more people say that developing countries should bear more of the cost. This suggests that Americans are just afraid that they’ll have to give up their gas guzzlers and all-night Christmas lights. 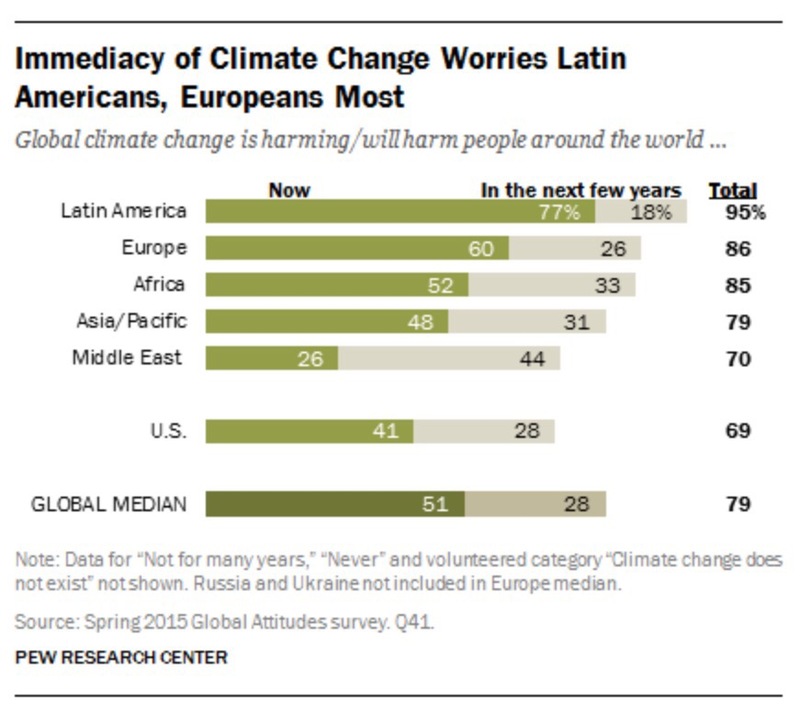 The USA is also a bit of an outlier in how imminent the harm caused by climate change will start affecting people. Only the Middle East (an oil-producing region, I may add) is less likely to say the danger is “now” than “in the next few years”. Moreover the USA and the Middle East also have the largest proportions of denialism since just about 7-in-10 gave an answer that indicate they think climate change is a threat. I hope this post puts some of my comments in a better context. These charts and the reports they come from (as well as other public opinion data) also stress the need for more action, including political organization around this issue. While the Peoples’ Climate March was a great idea, these opinion patterns precede the Trump presidency. And I fear they will get worse. As a few of my fellow writers have noted Ivy Taylor the mayor of San Antonio is in hot water after she made a stunningly unintelligent claim about what causes poverty. If you’ve yet to see the clip you can find it here. The statement begins at one hour and eight minutes in (in case you’re curious if you heard it in a snippet it wasn’t edited, it’s that bad). Ivy Taylor is known for courting controversy even on issues her own party (she’s a registered Democrat) has taken clear stances on. She refused to condemn Trump’s travel ban, she was booed during a prayer for the victims of the Pulse Nightclub shooting due to her track record on LGTBQIA issues. Her booing came after statements Ivy Taylor made in 2015 about the “waste of time” of a nondiscrimination ordinance she voted against in 2013 (which passed without her assistance anyway). Even when she takes the right stance, such as Taylor’s outspoken opposition to Texas’s own “bathroom bill“, was for economic reasons and not for simple moral ones. I’m going to start this off by stating that this is insulting to poor people independent of their religious beliefs. It’s insulting because of the clear implication that if you suffer from generational poverty there’s something wrong with your family and quite possibly with you. Additionally if you live in San Antonio and are someone who has suffered from generational poverty while also being Christian, this should be even more insulting to you than it is to atheists because it could be interpreted as her saying that you aren’t a true Christian. Are atheists and agnostics generally poverty stricken? Research seems to indicate that though some atheists and agnostics are affected by poverty the majority of us aren’t, and according to blind statistics we are less likely to be poverty-stricken than most of the various types of Christians that exist in significant numbers in the United States. One solid example of this is research from the Pew Research Center which breaks down the percentages of various religious stances by household income and showcases that in the cases of atheists and agnostics only 24% and 22% respectively of households are poverty stricken. What’s weird about this though is that Texas’s poverty rate has outstripped the U.S. poverty rate for decades according to Politifact, and Texas is the 11th most religious state which goes to show that Christianity cannot be a crucial factor in deterring generational poverty. It’s challenging to try and quantify such a silly claim. However at this point there’s enough research out there to understand that the idea that Christianity is a valid tool to overcome poverty is not based in reality. If that was the case then research like that of the Pew Research Center wouldn’t show that only two types of Christians typically have more wealth than atheists, and agnostics, (and also that only 5 types of Christians out of 19 surveyed are more resistant to poverty in the context of blind statistics) and the Episcopal Church and the United States Presbyterian Church wouldn’t be below the Jews and the Hindus in terms of wealth accumulation and below them in addition to being below atheists and agnostics in terms of preventing poverty. Additionally Christianity by itself is clearly not a tool to use to avoid becoming a divorcee or to not be a situation where one gets an abortion. It’s important that I state that none of these things make people broken, as Ivy Taylor seems to think they do given her statements, but these are things that are tied to poverty and in none of them is being a Christian and thus “having a relationship with the creator” advantageous. Therefore we can and should dismiss Ivy Taylor’s claim. If Mrs. Ivy Taylor was attempting to pander to the audience (the person who asked the question was with the Christian Coalition) I hope it didn’t work. But if she sincerely believes her claim she has to be one of the most incredibly out of touch democratic politicians I’ve had the displeasure of seeing making headlines and drawing the ire of both secular bloggers and even local newspapers. Hopefully she’ll learn from this mistake and not repeat it again in the future. The Pew Research Center released its now-traditional “Faith on the Hill” study of religion in Congress. Among the not-so surprising findings are that Christians are overrepresented compared to their share of the population. The most underrepresented group, once again: the nones (nonreligious/atheist/agnostic). Emma Green has a piece up at The Atlantic blaming nonreligious Americans for their lack of representation in Congress. In essence, she argues that secular Americans don’t vote in large numbers and for that reason they do not have enough members of Congress representing them. She also makes an argument that the movement is not coherent because many nonreligious people don’t really care about religion enough to organize about the issue. Both arguments are wrong. Let’s take first the first argument that the nonreligious do not vote enough to get representation. Green shows a chart from PRRI (full disclosure: I was once an employee of PRRI) showing the percentage of people who identify as nonreligious in the general population and the percentage of nonreligious voters in exit polls. The latter number is always much smaller, but that does not mean that we are certain that the secular cohort is less likely to vote. Most general population polls are conducted over the phone (landline and cellphones) and/or (increasingly) online. Exit polls are mostly done face-to-face. Considering how disliked are nonreligious people, particularly atheists, in the United States, it is possible that many secular-minded people are not willing to tell a stranger their real religious beliefs. Even if it were true that secular Americans are less likely to vote, they are still a significant part of the of the electorate and should have more than 1 openly nonreligious member. But in our political system numbers do not translate to equal representation. After all, women do not account for half of our representatives and people of color do not comprise a third of elected officials. Just because the number of secular Americans has jumped in the last decade, mostly thanks to young people, doesn’t mean that they have a pool of people ready to run for office and win offices that are not very often open for business when we consider the high reelection rates of incumbents. There are some changes coming that way. In 2016, the Freethought Equality Fund, a secular PAC, endorsed several candidates, many of whom got elected and did not run away from identifying with a secular label or from the support of a secular group. These candidates ran mostly at the state and local levels and represent a growing bench of secular leaders. On Green’s second point, that is hard to organize a group of people with little in common except for their lack of religion, truth is there is a lot in common. Secular Americans regardless of labels agree on many social and economic issues. As a Puerto Rican, I have experience with imagined identities among groups with a hint of history together. Latinos have become an important force by combining the forces of groups that share some traits, but also have some major differences (I know a bit about this, trust me). There are important problems of collective action in the secular movement that hinder its ability to become a major political force in the short term. I’ve written about this before. But there are important structural and cultural problems in this country exacerbating the lapses in political organization in the secular movement. Those are to blame for the lack of representation during this decade. We need to work on reversing them in the future. Religious advocates suggest parents need not worry about the lack of oversight because day cares are guided by a moral authority that eclipses any regulatory agency. In other words, because they respond to a “higher authority” these institutions don’t need to be accountable to the state. We seriously need to end religious privilege in this country and treat religious institutions not as special snowflakes but as any other organization that is bounded by the earthly rules of government. A couple of weeks ago Mark Silk wrote about a Pew poll that found that majorities of nones supported Sen. Bernie Sanders and Donald Trump in their respective party contests. According to the poll, 61 percent of Democratic or Democratic-leaning nones favor Sanders over former Secretary of State Hillary Clinton. Thirty-five percent prefer Clinton. On the Republican side, 57 percent of nones support Trump while Sen. Ted Cruz and Gov. John Kasich lag well behind with 17 percent each. The survey confirms a hunch I’ve had for a while. In my social media feeds there are apparently more Sanders than Clinton supporters. Of course, my maybe 1,000 social media contacts (some of them repeated across platforms and not all of them secular) are not likely to be representative of the nones, but those suspicions now are confirmed. Sen. Sanders’s support is strongest among young Americans of the Millennial generation. This happens to be the most secular generation as well. On paper, it is also a generation that is to the left of the general population on social/economic issues (in favor of more spending on government services and the social safety net). In this regard secular Millennials are the core of Sanders’s coalition. What I wasn’t sure, though I also had a hunch, was the preferred candidate among Republican nones. My social media contacts were no good for this since I barley have any Republicans, let alone any Republican nones (these are very rare). My hunch was that the GOP-leaning nones’ preferences were maybe leaning toward Trump, and that Kasich would be ahead of Cruz. And I was way off-target in that regard. Two-thirds of Republican nones are men according to Pew’s Religion Landscape Survey. My reading of the Republican nones assumes that this is a conservative group on economic matters but more liberal on cultural matters. That assumption is likely correct and will be the subject of a forthcoming post. Trump, depending on the day, is the least religious candidate in the Republican field, a positive for those who only care about Church-State issues. What I probably underestimated is the extent of the racism, sexism, and hatred to “pc dialogue” among many in the secular community. It’s fair to say that, for the first time in American history, the Nones making their influence felt on the presidential nominating process. I am aware that some communities such as men’s rights activists and even groups of white supremacists can be a draw for secular men. And I think that is what drives Trump’s high numbers among the Republican nones, who are primarily young men. Two-thirds of Republican nones are men according to Pew’s Religion Landscape Survey. Mark Silk interprets the Pew poll findings as part of a “year of the nones”making their influence felt on the presidential nominating process.” I partly agree with that interpretation. It is true that the nones are becoming larger portions of the parties’ coalitions. But the secular movement keeps waiting for the parties to knock on their doors instead of trying a hostile takeover of party structures. What I mean is that nones are not being organized as political blocs but rather as individual voters who happen to coincide in their preferences for particular candidates. That is no way to gain any sort of clout. While I think the none vote will be decisive, it is less clear if politicians will care until there is a coordinated effort in the secular leadership to exploit their strength in numbers. In that sense I would modify Silk’s “year of the nones” to the “year of the none” because it is the coincidence of individual nones what may become decisive in this primary season, rather than the collective undertaking of the nones to affect the ouctome of the elections.